Let's see just how well the Tesla Model S P100D fares when it's a more lengthy, half-mile challenge. Generally, most of the races we find and share are of the quarter-mile variety, which makes sense since that's really a standard metric, like zero-to-60-mph times. One big complaint from many is that an electric car with huge initial torque may perform well in a short race, but not so much in the long run. Of course, the other battle comes down to how well would these Tesla's do on a winding track, but that's another story, right? Some of you may be surprised at the results ... some, not so much. It's important to keep in mind that as you shop for your next car, while quarter-mile and half-mile times are great, and cars that impress in those areas are "King" in many outlets, unless you're breaking the law or beating your car up at the drag strip, zero-to-30-mph and zero-to-60-mph metrics are really all we might utilize and experience in real-world, public-road driving. 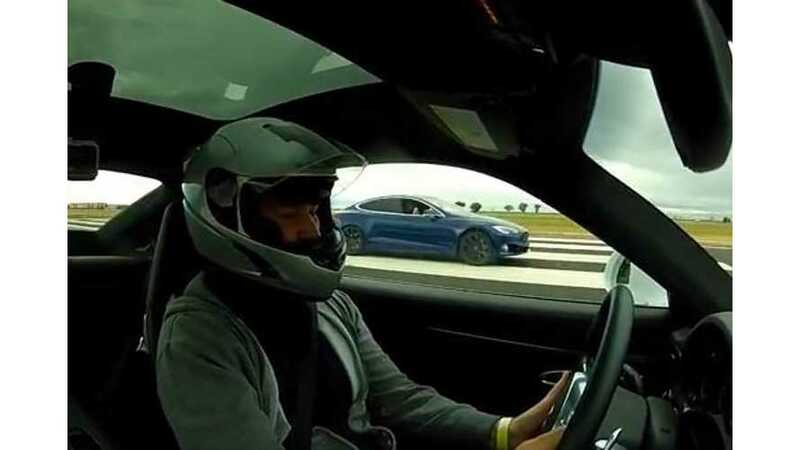 Longboarder's 2015 Porsche 911 Turbo S takes on a Tesla Model S P100D "Ludicrous Mode" at OmegaMotorsports NoFlyZone California April 7, 2018.